Their biggest gig to date, the anticipant crowd packed into the main hall of the majestic building, greeting the performers with exuberance. The band immediately launched into a well-crafted set, deftly combining songs mostly drawn from their last three albums. No mean feat when each album has its own distinct feel. They could even be accused of bordering on the concept album genre, but not quite tipping far enough into that self-indulgent ilk. However the performance gradually created an atmosphere all of its own. From their innovative early days of donning large flashing lights, affixed to their chests, which pulsed to coordinate in time to each tune throughout their gigs, they have always prioritised the spectacle to enrich their musical performance. Fortunately their obviously increased budget didn’t go to anyone’s head leading to some unfortunate ostentatious ‘son et lumiere’, instead it was subtly employed to produce an intricate light show to wonderfully augment the signature intricacies of their vocals which layer and interweave to orphic effect. An effect even more enjoyable when witnessed live, with their ‘front tailing’ backing vocals bringing added dimension to melodies, drawing the listener further into the beguiling and unique story telling style the band has continuously developed. ‘I’m Aquarius’ particularly sprang to life certainly benefiting from a live rendition, indeed it was one amongst several tracks that were beautifully accentuated as the band physically re-arranged themselves to complement and heighten the different arrangements of vocal and instruments throughout the set. On occasion unhurriedly appearing to take up their instruments only just in time for their cue, creating some unexpected and amusing drama. As the set drew on the band's confidence seemed to grow, and although they have always produced tight performances their presence seemed to expand, filling the extensive space, the atmosphere building in tandem, a skilful arrangement of glitter balls creating a spectacle filling the room with a snow storm effect during ‘The Look’ to generate some early Christmas atmosphere. Later, during the acoustic songs, a multitude of red lasers lanced back and forth through the opulent hall adding depth and a little wonderment to what could otherwise have risked being a lull in the performance. The crowd obviously enjoyed the, apparently now traditional, oddity of a cover track - a brave attempt at The Beatles' ‘Here Comes The Sun’ was in fact a skilful and fairly faithful recreation of the original, providing an interesting touchstone of their musical proficiency. The only slight downside was caused by the backing vocals appearing to be slightly obscured when the bass kicked particularly loudly however this tiny issue hardly diminished from an entrancing performance of artful intelligent pop set within a retro-futuristic backdrop. 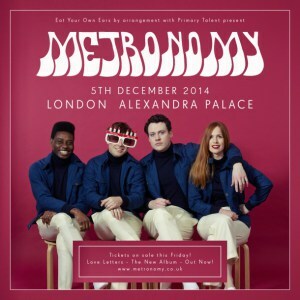 Metronomy are band definitely still in their ascendance.